Cumberland Medical Center’s Cancer Center is the first cancer center east of Nashville to earn the American College of Radiology (ACR) Radiation Oncology accreditation. “This is a tremendous honor because the ACR’s rigorous process took an in-depth review of our radiation oncology program to ensure it meets or excels in the best practices established for radiation cancer treatment,” says CMC Cancer and Breast Center Manager Tom Rally. CMC’s Cancer Center has been awarded a three-year term of accreditation in radiation oncology as the result of a recent review by the ACR. Radiation oncology (radiation therapy) is the careful use of high-energy radiation to treat cancer. A radiation oncologist may use radiation to cure cancer or to relieve a cancer patient’s pain. Board-certified radiation oncologists and medical physicists with ACR performed an onsite evaluation in support of qualifying for this accreditation. Together, they toured the cancer center in Crossville, held interviews with hospital staff essential to cancer treatment, and reviewed patient outcome data. 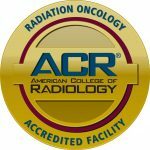 The ACR is the nation’s oldest and most widely accepted radiation oncology accrediting body, with over 700 accredited sites, and 30 years of accreditation experience. The ACR seal of accreditation represents the highest level of quality and patient safety. It is awarded only to facilities meeting specific Practice Guidelines and Technical Standards developed by ACR after a peer-review evaluation by board-certified radiation oncologists and medical physicists who are experts in the field. Patient care and treatment, patient safety, personnel qualifications, adequacy of facility equipment, quality control procedures, and quality assurance programs are assessed. The findings are reported to the ACR Committee on Radiation Oncology Accreditation, which subsequently provides the practice with a comprehensive report they can use for continuous practice improvement. As a member of Covenant Health and Thompson, our region’s largest cancer fighting network, Cumberland’s Cancer Center brings board certified physicians and surgeons closer to where patients of the Cumberland Plateau call home. For more information, please call (931) 456-8390.